This breed was developed in the rough terrain of the Shetland islands where the climate is quite harsh. 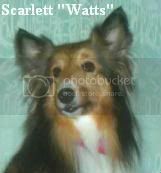 Early members of the breed were small and not nearly as elegant of coat. They were excellent herding dogs of not only sheep but horses as well. Since fences were not used at the time, their herding skills were highly sought after. Adjectives describing this breed are “sensitive, bright, obedient, gentle, playful, and extremely willing to please.” They are good with children too—sounds like the perfect combination of dog and pet! They are initially shy of strangers so we as groomers usually use their first visit to work slowly and earn their confidence. They may nip otherwise. The coat is double with a fine dense undercoat and a coarse long primary coat. The undercoat can be a shedding machine so frequent brushing is necessary (twice a week) and professional grooming should happen every 6 weeks. 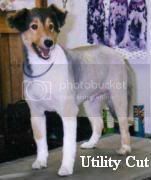 The breed groom calls for a thorough brushing and light trimming of hair around the ears and neck to maintain the shape. Most of our customers want us to trim leg and chest feathers some and also remove hair on the hind quarters under the tail. Shaping the rear end keeps them more cleanly whent they relieve themselves. While we have some customers who have their Shelties clipped short all over (a utility cut), we prefer to keep that beautiful coat brushed out. This is a breed that our thinning tools can really do a good job with. 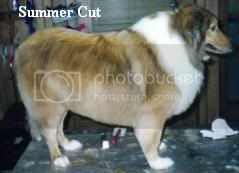 They allow us to remove a lot of undercoat while maintaining the bulk of the primary coat—you experience less shedding and your dog feels more comfortable in hot weather without losing the asthetic aspect of the coat. 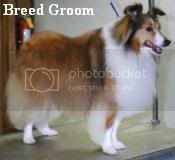 This entry was posted on Monday, July 2nd, 2007 at 1:30 pm	and is filed under Breeds: As Related to Grooming. You can follow any responses to this entry through the RSS 2.0 feed. You can leave a response, or trackback from your own site.